COnneCt engage penCil it in MiChelle's piCks on our publisHer's september calenDar 1 | Taste of Madison. can't wait to enjoy the food and bands. tasteofmadison.com. 7 | UW Home Football Game. you rah rah wi-i-i-sco-on-sin! uwbadgers.com 12 | CSA Mixology Class. fresh veggies and vodka at Death's Door Distillery—sign me up! csacoalition.org. deathsdoorspirits.com. 19 | Equinox Extravaganza. cheers to this new fundraiser at yahara bay Distillery to benefit breast cancer recovery. yaharabay.com. 21 | New Central Library Opening. looking forward to seeing this new madison gem! madisonpubliclibrary.org. 21 | JDRF Ride to Cure Diabetes in Nashville. thanks ya'll for helping raise $3,000 for a cure! ride.jdrf.org. 26-29 | Wisconsin Science Festival. love learning with my kids. wisconsinsciencefest.org. 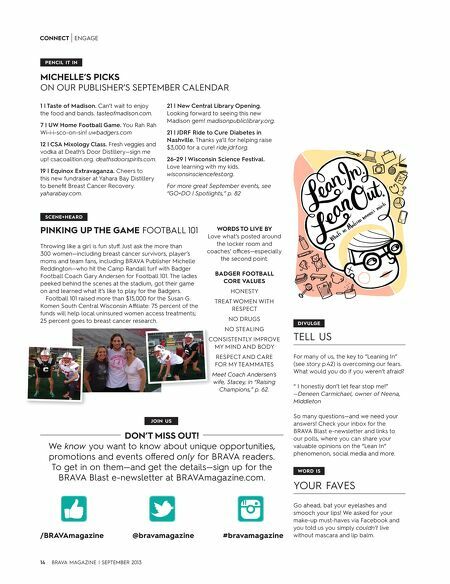 For more great September events, see "GO+DO | Spotlights," p. 82 sCene+heard pinking up the gaMe football 101 throwing like a girl is fun stuff. Just ask the more than 300 women—including breast cancer survivors, player's moms and team fans, including brava publisher michelle reddington—who hit the camp randall turf with badger football coach gary andersen for football 101. the ladies peeked behind the scenes at the stadium, got their game on and learned what it's like to play for the badgers. football 101 raised more than $15,000 for the susan g. Komen south central wisconsin aﬃliate: 75 percent of the funds will help local uninsured women access treatments; 25 percent goes to breast cancer research. wOrds tO live BY love what's posted around the locker room and coaches' oﬃces—especially the second point. Badger fOOtBall COre values Honesty treat women witH respect no Drugs no stealing consistently improve my minD anD boDy respect anD care for my teammates Meet Coach Andersen's wife, Stacey, in "Raising Champions," p. 62. JOin us dOn't Miss Out! we know you want to know about unique opportunities, promotions and events offered only for brava readers. to get in on them—and get the details—sign up for the brava blast e-newsletter at bravamagazine.com. 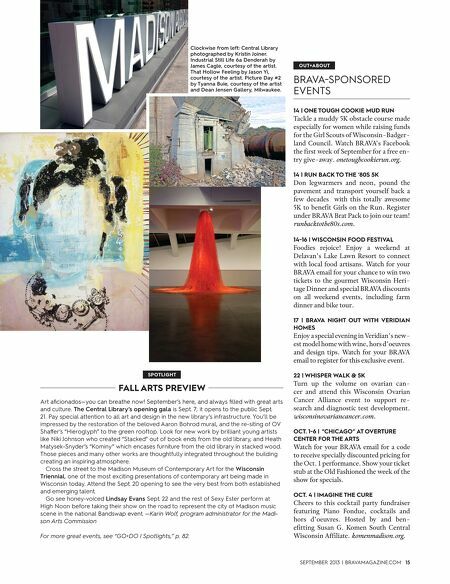 /Bravamagazine 14 @bravamagazine brava magazine | september 2013 #bravamagazine divulge tell us for many of us, the key to "leaning in" (see story p.42) is overcoming our fears. what would you do if you weren't afraid? " i honestly don't let fear stop me!" —Deneen Carmichael, owner of Neena, Middleton so many questions—and we need your answers! check your inbox for the brava blast e-newsletter and links to our polls, where you can share your valuable opinions on the "lean in" phenomenon, social media and more. wOrd is your faves go ahead, bat your eyelashes and smooch your lips! we asked for your make-up must-haves via facebook and you told us you simply couldn't live without mascara and lip balm.